The second-generation Tesla Roadster features an impressive spec sheet—0 to 100 km/h in 1.9 seconds, 0 to 160 km/h in 4.2 seconds, a claimed top speed of 402 km/h, and a range of 1000 km. Apollo Automobili is a resurrection from the now-defunct Gumpert brand after it was purchased by a group of investors from Hong Kong. The Apollo Arrow is the first car to wear the new badge and boasts 1000-hp from a twin-turbo 4.0-litre V8 engine sourced from Audi. The design features aggressive lines, inspired perhaps by a dragon, or maybe a shark. The Lamborghini Veneno, when introduced in 2013, was the most expensive production car in the world with a price tag of HK$35 million. Performance-wise, the engine is based on the 6.5 litre V12 from the Lamborghini Aventador and the top speed is limited electronically to 354 km/h. Only five cars were made, two of which were kept by Lamborghini. The Aston Martin One-77 features a full carbon fibre monocoque chassis, a handcrafted aluminium body, and a naturally aspirated 7.3 litre V12 engine with 750-hp. As the name suggests, only 77 cars were built by the company but that number was later reduced to 76 working cars after an owner, who had just received his car, crashed it on the streets of Hong Kong in 2012. The Jaguar XJ220 was produced from 1992 to 1994 and has now attained the status of an icon. The car was developed from a V12-engined four-wheel drive concept car, designed by a group of Jaguar employees working in their spare time but later made way for a twin-turbocharged V6 generating 540-hp and rear-wheel drive. Mike Tyson is among the notable owners of this car. The McLaren P1 is the worthy successor of the McLaren F1, utilising hybrid power and Formula 1 technology. 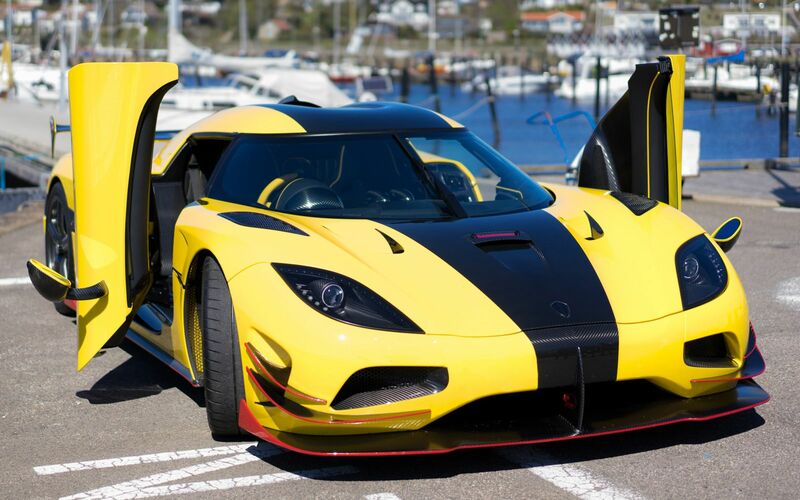 It is a plug-in hybrid hypercar with a 3.8 litre twin-turbo V8 petrol engine delivering 727-hp, combined with an in-house developed electric motor producing 176-hp giving the car a total of 903-hp. Like the McLaren P1, the Ferrari LaFerrari—meaning "TheFerrari" in Italian in the sense that it is the "definitive" Ferrari—is the first mild hybrid hypercar from the company capable of 950-hp, with the combination of a mid-rear mounted 6.3 litre V12 and a hybrid system modeled on the Kinetic Energy Recovery Systems (KERS) used in Ferrari’s Formula One cars. The Lamborghini Aventador S improves on its little brother by outputting 40-hp more with the same iconic 6.5 litre V12 engine. The S received four-wheel steering, permanent four-wheel drive and a slightly updated suspension, a redesigned nose was with a bigger front splitter and two new air ducts in the front bumper. The Porsche 918 Spyder completes the trio of hybrid hypercars and develops 887-hp from a naturally aspirated 4.6 litre V8 engine and two electric motors. One electric motor drives the front axle of the car while the second electric motor drives the rear wheels in parallel with the engine, which also serves as the main generator. The Bentley Continental GT appeared in 2003 and has gone through many iterations since. The model that interests us is the Continental GT Speed and, as the name suggests, it's all about performance for this grand tourer. With 616-hp, you'll pass the 320 km/h mark in style and comfort thanks to quilted leather, massage seats and luxurious hand-stitched upholstery. The second generation of the Audi R8 is the one that allowed the car to finally join the 320 km/h club with the V10 Plus model, generating 602-hp. A full electric e-tron version of the Audi R8 allows you to have a 450-hp supercar while being environmentally friendly.